Thomas wakes up in an elevator, remembering nothing but his own name. He emerges into a world of about 60 teen boys who have learned to survive in a completely enclosed environment, subsisting on their own agriculture and supplies. A new boy arrives every 30 days. 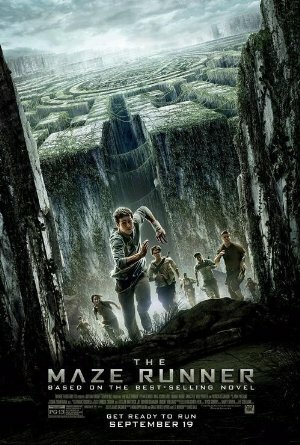 The original group has been in "The Glade" for three years, trying to find a way to escape through the Maze that surrounds their living space. They have begun to give up hope. Then a comatose girl arrives with a strange note, and their world begins to change. There are some great, fast-paced action scenes, particularly those involving the nightmarish Grievers who plague the boys.